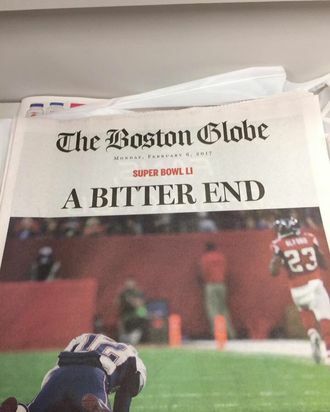 The Boston Globe may have sent their early edition to the printer around the same time Patriots fans gave up and went to bed, with New England down 28 to 3. Which apparently meant some early-edition subscribers in Florida received an alternative-facts version of the front page Monday. The Washington Post early edition was at least a bit more circumspect.